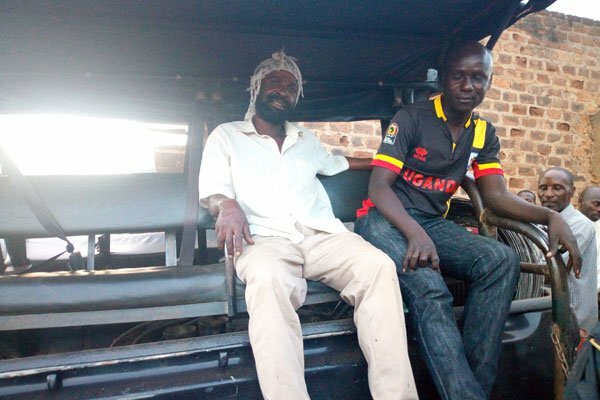 Paul Kiveyiganga (left) who operates the scrap shop on a police patrol truck after his arrest (PML Daily PHOTO). MUBENDE – Two smoke bombs have on Friday 11 exploded in a metal scrap store found in Kasambya Town Council in Mubende district. These bombs have been found by the army and the operator of the store has been arrested. Mr. Paul Kiveyiganga, the operator of the store narrates how he was hit by falling debris from the store after an explosion. “I heard a loud bang that was followed by sudden flames. When I tried to run away, some falling debris from the damaged store hit me,” he said. Ms Jalia Namuyamba, a neighbour to Kiveyiganga said she heard an explosion which was followed by huge flames and thick smoke from the scrap store. “After hearing the explosion, then I saw flames. Thereafter, Kiveyiganga’s store was completely destroyed to ashes,” Namuyamba said. According to Brig Sunday Dues, the community liaison officer from Kabamba Military Academy, two tins of smoke bombs were recovered after the search. Brig Sunday adds that residents might have picked them from Kabamba shooting grounds to sell them as scrap. “Among other items that we discovered are the misfired cartridges of ammunitions which were used during training some time back and people could have picked them to get quick money,” He said. Ms James Bichasi, an officer attached to the police bomb squad, has however encouraged the public to very careful with strange objects and report to authorities immediately after discovering them. “I strongly caution scrap dealers against buying any materials brought to them. Not everything that looks like metal is scrap, some items are meant to be handled by only a classified group of people like the police and the army,” he said.